This year the Aesthetics Department celebrates the 30th Anniversary of the Art Elective Programme in Nanyang Girls' High School. 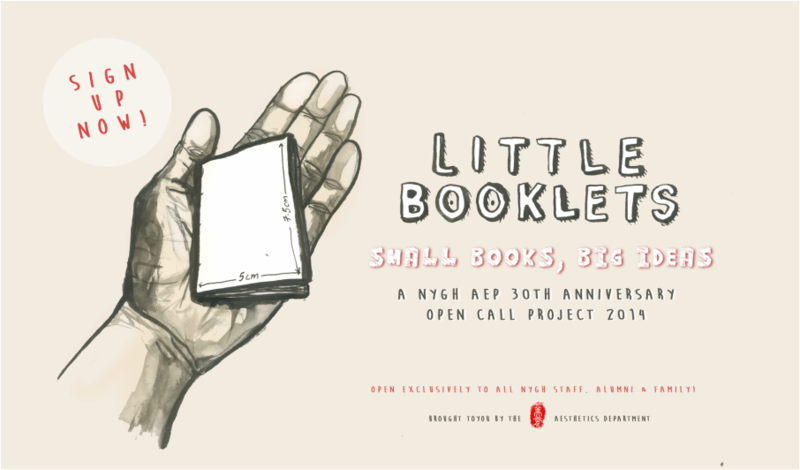 Members in the Art Unit have come together to launch an open call, "Little Booklets", which for the very first time, will be open to all staff, alumni and their families. This is a project that encourages an organic process in creating unique A8 sized booklets. The idea is to produce something interesting, think out of the box, and to try out something new! "Little Booklets" have no restriction on theme. Contributors are encouraged to interpret and develop the A8 sized booklet in any way that they imagine. Books are universally loved; there is no greater pleasure than flicking through the pages of a book. Our ‘little books’ are accessible to everyone; it is this accessibility that makes our individual palm sized books so attractive. We are engaging the desire inside us all to craft and share our own unique creation. Our inspiration to offer the Nanyang family this wonderful opportunity to share their own personal snapshot comes from the recent ‘Buku Mini’ exhibition that showcased the work of diverse individuals, from different walks of life; here a moment in time and thought was crystallized in the form of a mini-sketchbook. We will connect with participants in an exciting process of developing a booklet that organically grows into the final piece of work. Each final piece of work becomes a chapter, a snapshot in the unfolding story of our Art Elective Programme community. We enthusiastically celebrate the 30th anniversary of the AEP at Nanyang Girls’ High School through putting our tenets into practice: our art is more than just the sum of artistic skills and techniques. It is a passionate journey of artistic expression, which challenges conventional thinking and imagination. It transforms the way we view ourselves and the world. Some artworks from the 'Buku Mini' exhibition. We are offering all of our participants a small and wonderful blank booklet at $5.00 each. Contributors will use the pages of this highly personal memento to develop and create their own unique story. We will use the synergy between the various contributors to generate our own creative library of mini books. There is no restriction on theme- the idea is to produce something interesting, think out of the box, and to try out something new! This hand stitched booklet of 20 pages measures 5cm x 8cm in size (A8 size). The proceeds will be donated to the fundraising efforts that will take place on 16 August 2014. An email will be sent as confirmation of your participation. Once complete, the Little Booklets will be featured in an exhibition showcase in the Nanyang Art Gallery. Official Opening : Saturday,16 August 2014, in conjunction with the NYGH Food and Fun Fair. Pick up a registration form from the Aesthetics Department on weekdays(8am - 5.30pm),at the GO counter on Saturday (8am - 12nn)or go paperless by retrieving a form from our website, and sending it back to this email address with 'LITTLE BOOKLETS (yourname)' in the subject header. Contributors will initial the final page of ‘the Little Booklets’ to identify themselves as their book’s author. Entries will be submitted in the ziplock bag that came with the ‘Little Booklet’, and will include the author’s name, the book’s title, and a single line describing the submission on the sticker provided. The Little Booklets will be returned from the Aesthetics Department after the close of the exhibition from 28th September 2014 to 28th October 2014. The Aesthetics Department will decide on the fate of the uncollected books after the return deadline. The material may be used for publicity, with excerpts made into a zine for distribution. It may also be archived on online platforms. Please also note that the Little Booklets will be handled by visitors at the exhibition. The school and the Aesthetics Department will not be responsible for any loss or damage to your Little Booklet.